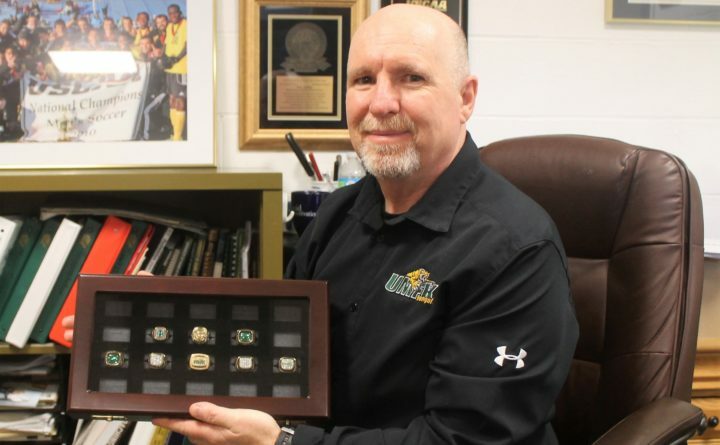 University of Maine at Fort Kent athletic director and men's soccer coach Bill Ashby displays a collection of championship rings in his office in April 2017. The university announced on Wednesday that Ashby is leaving UMFK to take a position at Unity College. Bill Ashby has been a fixture at the University of Maine at Fort Kent since 2006 as the school’s director of athletics and men’s soccer coach. Now, he’s moving on to the next chapter of his career. Ashby is relinquishing his positions at UMFK to become the Director of International Admissions and Transfers at Unity College. Under Ashby’s leadership, all five UMFK athletic programs reached the United States Collegiate Athletic Association national tournament during 2017-2018. There are now more than 100 student-athletes competing at the school. Under Ashby, the men’s soccer program compiled a 224-17-6 overall record, with 10 of those losses coming at either the NAIA or USCAA national tournament. His teams won the USCAA national championship in 2010, 2015 and 2016 (23-0-0). Ashby’s team have won 20 or more games six times and have never lost more than three times in a season.In 2015, he was recognized by his peers and association as USCAA National Coach of the Year. Over the course of 33 seasons, Ashby’s teams own a career record of 451-193-25. He is among only 38 coaches, active or retired, to reach 400 victories. He also has coached at UMaine-Machias, Husson University in Bangor, Maine Maritime Academy in Castine, Brescia University and the University of Mary. Ashby directed both the men’s and women’s teams at Brescia. As athletics director, Ashby has led a department that has produced 10 national championship teams and 75 All-Americans. “I was blessed with a professional staff of coaches, exceptional coaches and great people, always willing to out-work, out-recruit, and out-coach all others,” Ashby said.